Surely, every NFL player, coach, and team owner dreams of winning the Big Game. Some ultimately do get to hoist the Lombardi Trophy, though most go away empty handed. But, a handful can take consolation in cruising aboard their yachts. Indeed, over the years, several owners and players have enjoyed life afloat. Since this Sunday marks Super Bowl LII, we decided to take a look at superyachts of Super Bowl contenders. 1. Floridian. The late Wayne Huizenga was well-known as the owner of the Miami Dolphins, acquiring the team in 1994 and selling it in 2008. The Dolphins made it to the playoffs eight times under his ownership. Interestingly, the Dolphins marked his third Florida-based sports team. So, Floridian was certainly more than an appropriate name to give his 228-foot (69.5-meter) megayacht. She launched in 2003 as Aussie Rules, for yet another sports celebrity, golfer Greg Norman. Norman sold her to Huizinga the following year. Floridian had an onboard theater when that trend was only just beginning. Today, Floridian is known as Nomad. 2. Kismet. 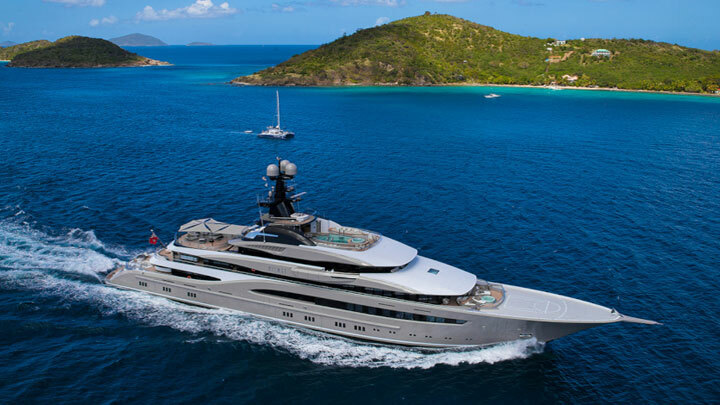 No listing of superyachts of Super Bowl contenders would be complete without Kismet (above). She belongs to Shahid Khan, who might still be shaking his head over his Jacksonville Jaguars’ final playoff game on January 21. The team was beating the New England Patriots, on the verge of its first-ever Super Bowl with about five minutes to go. But it lost. Nevertheless, Khan proudly docks the 308-foot (94-meter) Kismet in Jacksonville throughout the season. He took delivery in 2014. When he’s not enjoying personal cruises or entertaining business associates, Kismet charters, upwards of $1.4 million per week. She shows off lavish Art Deco design. Kismet also has the coolest bowsprit ever, a jaguar with glowing teal eyes. 3. Lady Gayle Marie. Every few months, our article about Lady Gayle Marie’s debut piques interest. It typically coincides with owner Tom Benson, who also owns the New Orleans Saints, enjoying some cruising time aboard the 140-footer (42.7-meter). 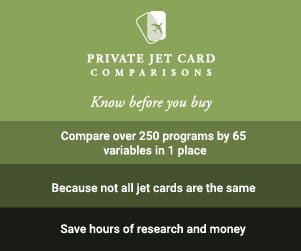 He’s quite private, so no photos are available of the interior. Coincidentally, he took delivery of the yacht in 2010, the year after the Saints last won the Super Bowl. The Saints have appeared in the playoffs nearly a dozen times under his ownership as well, dating to 1985. 4. Lady S. Dan Snyder, the owner of the Washington Redskins since 1999, bought the 225-foot (68.5-meter) Lady S in 2011. The team last made it to the Big Game in 1992. Under his ownership, however, the Redskins have made the playoffs—in 2007, 2012, and 2015. If you want to live like he does, you can charter Lady S. She’s available for $497,000 during high season in the winter in the Caribbean and Bahamas. You can admire original art from Chagall aboard, and indulge in the spa, with a hammam. 5. Octopus. 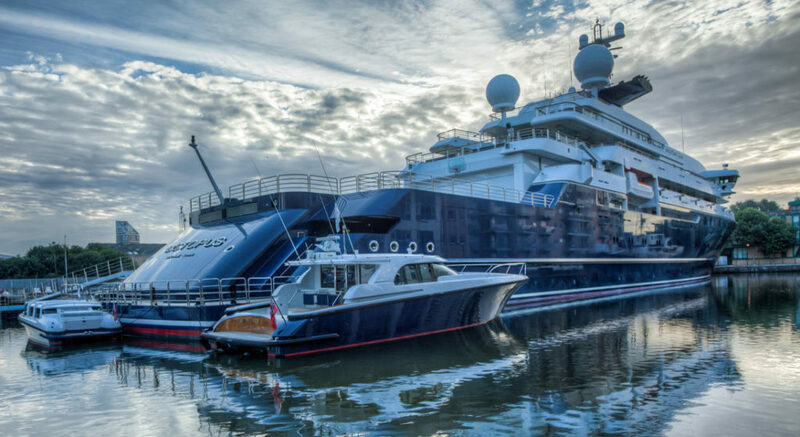 While Octopus (at top) is last on our list of superyachts of Super Bowl contenders, she is by far the largest. Paul Allen bought the Seattle Seahawks in 1996, and took delivery of the 414-foot (126-meter) Octopus seven years later. The Seahawks have three Super Bowl appearances under Allen, in 2005, 2013, and 2014, with a win in 2013. You might not know it by looking at Octopus, though. She has a basketball hoop hanging over her long aft deck. (Allen also owns the Portland Trail Blazers.) Octopus further has a recording studio onboard. While strictly private, the yacht has assisted scientists in accessing historic wrecks around the world.